The decline of standards amongst some users of revived Cornish had been a cause for concern for some time. 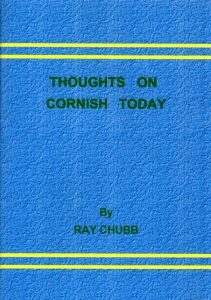 Ray Chubb has therefore examined recent writings in the Standard Written Form (main graphs) and Common Cornish. He has identified a number of usages that are less than authentic which he highlights in this booklet. There is also a useful appendix which provides copious examples of good Cornish idiom. SWF. Also available under free books.